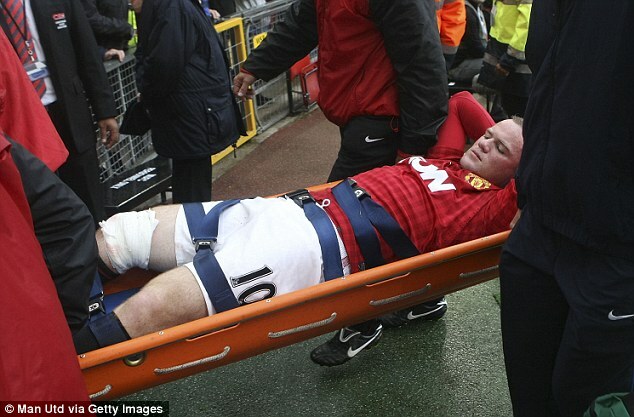 Rooney on his way to the hospital. Wayne Rooney suffered a nasty gash in a premier league match and here’s a snapshot of the Manchester United striker’s day on the pitch. The England star was left with a deep gash in his leg, a wound so serious it had to be treated in hospital. He stayed there overnight receiving stitches on his deep wound. Rooney is expected to be out of action for about a month, which means he could miss England’s World Cup qualifying matches against Moldova and Ukraine.